In this section, we will focus on the final point: namely, how to slice, dice, and generally get and set subsets of pandas objects. The primary focus will be on Series and DataFrame as they have received more development attention in this area. Expect more work to be invested higher-dimensional data structures (including Panel) in the future, especially in label-based advanced indexing. The Python and NumPy indexing operators  and attribute operator . provide quick and easy access to pandas data structures across a wide range of use cases. This makes interactive work intuitive, as there’s little new to learn if you already know how to deal with Python dictionaries and NumPy arrays. However, since the type of the data to be accessed isn’t known in advance, directly using standard operators has some optimization limits. For production code, we recommended that you take advantage of the optimized pandas data access methods exposed in this chapter. See the MultiIndex / Advanced Indexing for MultiIndex and more advanced indexing documentation. Object selection has had a number of user-requested additions in order to support more explicit location based indexing. pandas now supports three types of multi-axis indexing. .ix supports mixed integer and label based access. It is primarily label based, but will fall back to integer positional access unless the corresponding axis is of integer type. .ix is the most general and will support any of the inputs in .loc and .iloc. .ix also supports floating point label schemes. .ix is exceptionally useful when dealing with mixed positional and label based hierachical indexes. However, when an axis is integer based, ONLY label based access and not positional access is supported. Thus, in such cases, it’s usually better to be explicit and use .iloc or .loc. Beginning with version 0.11.0, it’s recommended that you transition away from the following methods as they may be deprecated in future versions. None of the indexing functionality is time series specific unless specifically stated. You may find this useful for applying a transform (in-place) to a subset of the columns. You can use attribute access to modify an existing element of a Series or column of a DataFrame, but be careful; if you try to use attribute access to create a new column, it fails silently, creating a new attribute rather than a new column. You can use this access only if the index element is a valid python identifier, e.g. s.1 is not allowed. See here for an explanation of valid identifiers. The attribute will not be available if it conflicts with an existing method name, e.g. s.min is not allowed. Similarly, the attribute will not be available if it conflicts with any of the following list: index, major_axis, minor_axis, items, labels. In any of these cases, standard indexing will still work, e.g. s['1'], s['min'], and s['index'] will access the corresponding element or column. The Series/Panel accesses are available starting in 0.13.0. If you are using the IPython environment, you may also use tab-completion to see these accessible attributes. The most robust and consistent way of slicing ranges along arbitrary axes is described in the Selection by Position section detailing the .iloc method. For now, we explain the semantics of slicing using the  operator. With DataFrame, slicing inside of  slices the rows. This is provided largely as a convenience since it is such a common operation. pandas provides a suite of methods in order to have purely label based indexing. This is a strict inclusion based protocol. at least 1 of the labels for which you ask, must be in the index or a KeyError will be raised! When slicing, the start bound is included, AND the stop bound is included. Integers are valid labels, but they refer to the label and not the position. pandas provides a suite of methods in order to get purely integer based indexing. The semantics follow closely python and numpy slicing. These are 0-based indexing. When slicing, the start bounds is included, while the upper bound is excluded. Trying to use a non-integer, even a valid label will raise a IndexError. For slicing rows explicitly (equiv to deprecated df.irow(slice(1,3))). For slicing columns explicitly (equiv to deprecated df.icol(slice(1,3))). Out of range slice indexes are handled gracefully just as in Python/Numpy. # Only works in Pandas starting from v0.14.0. Prior to v0.14.0, iloc would not accept out of bounds indexers for slices, e.g. a value that exceeds the length of the object being indexed. The .loc/.ix/ operations can perform enlargement when setting a non-existant key for that axis. In : se = 5. This is like an append operation on the DataFrame. Since indexing with  must handle a lot of cases (single-label access, slicing, boolean indexing, etc. ), it has a bit of overhead in order to figure out what you’re asking for. If you only want to access a scalar value, the fastest way is to use the at and iat methods, which are implemented on all of the data structures. You can also set using these same indexers. at may enlarge the object in-place as above if the indexer is missing. Another common operation is the use of boolean vectors to filter the data. The operators are: | for or, & for and, and ~ for not. These must be grouped by using parentheses. Note, with the choice methods Selection by Label, Selection by Position, and Advanced Indexing you may select along more than one axis using boolean vectors combined with other indexing expressions. DataFrame also has an isin method. When calling isin, pass a set of values as either an array or dict. If values is an array, isin returns a DataFrame of booleans that is the same shape as the original DataFrame, with True wherever the element is in the sequence of values. Oftentimes you’ll want to match certain values with certain columns. Just make values a dict where the key is the column, and the value is a list of items you want to check for. Selecting values from a Series with a boolean vector generally returns a subset of the data. To guarantee that selection output has the same shape as the original data, you can use the where method in Series and DataFrame. In addition, where takes an optional other argument for replacement of values where the condition is False, in the returned copy. Where can also accept axis and level parameters to align the input when performing the where. This is equivalent (but faster than) the following. mask is the inverse boolean operation of where. DataFrame objects have a query() method that allows selection using an expression. Do the same thing but fall back on a named index if there is no column with the name a. If for some reason you have a column named index, then you can refer to the index as ilevel_0 as well, but at this point you should consider renaming your columns to something less ambiguous. The convention is ilevel_0, which means “index level 0” for the 0th level of the index. query() also supports special use of Python’s in and not in comparison operators, providing a succinct syntax for calling the isin method of a Series or DataFrame. 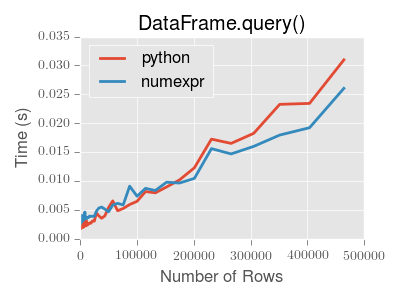 (b + c + d) is evaluated by numexpr and then the in operation is evaluated in plain Python. In general, any operations that can be evaluated using numexpr will be. You can negate boolean expressions with the word not or the ~ operator. 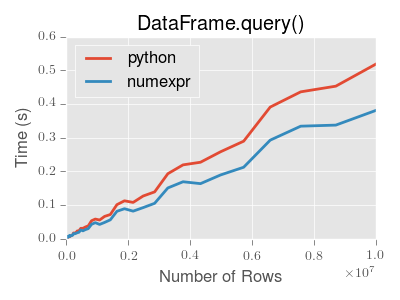 This plot was created using a DataFrame with 3 columns each containing floating point values generated using numpy.random.randn(). If you want to identify and remove duplicate rows in a DataFrame, there are two methods that will help: duplicated and drop_duplicates. Each takes as an argument the columns to use to identify duplicated rows. duplicated returns a boolean vector whose length is the number of rows, and which indicates whether a row is duplicated. By default, the first observed row of a duplicate set is considered unique, but each method has a take_last parameter that indicates the last observed row should be taken instead. Each of Series, DataFrame, and Panel have a get method which can return a default value. The pandas Index class and its subclasses can be viewed as implementing an ordered multiset. Duplicates are allowed. However, if you try to convert an Index object with duplicate entries into a set, an exception will be raised. Indexes are “mostly immutable”, but it is possible to set and change their metadata, like the index name (or, for MultiIndex, levels and labels). You can use the rename, set_names, set_levels, and set_labels to set these attributes directly. They default to returning a copy; however, you can specify inplace=True to have the data change in place. See Advanced Indexing for usage of MultiIndexes. In : ind.name = "bob"
In 0.15.0. the set operations + and - were deprecated in order to provide these for numeric type operations on certain index types. + can be replace by .union() or |, and - by .difference(). The two main operations are union (|), intersection (&) These can be directly called as instance methods or used via overloaded operators. Difference is provided via the .difference() method. Also available is the sym_diff (^) operation, which returns elements that appear in either idx1 or idx2 but not both. This is equivalent to the Index created by idx1.difference(idx2).union(idx2.difference(idx1)), with duplicates dropped. Occasionally you will load or create a data set into a DataFrame and want to add an index after you’ve already done so. There are a couple of different ways. The output is more similar to a SQL table or a record array. The names for the columns derived from the index are the ones stored in the names attribute. reset_index takes an optional parameter drop which if true simply discards the index, instead of putting index values in the DataFrame’s columns. The reset_index method used to be called delevel which is now deprecated. When setting values in a pandas object, care must be taken to avoid what is called chained indexing. Here is an example. dfmi['one'] selects the first level of the columns and returns a data frame that is singly-indexed. Then another python operation dfmi_with_one['second'] selects the series indexed by 'second' happens. This is indicated by the variable dfmi_with_one because pandas sees these operations as separate events. e.g. separate calls to __getitem__, so it has to treat them as linear operations, they happen one after another. Contrast this to df.loc[:,('one','second')] which passes a nested tuple of (slice(None),('one','second')) to a single call to __getitem__. This allows pandas to deal with this as a single entity. Furthermore this order of operations can be significantly faster, and allows one to index both axes if so desired. You can control the action of a chained assignment via the option mode.chained_assignment, which can take the values ['raise','warn',None], where showing a warning is the default. This however is operating on a copy and will not work. A chained assignment can also crop up in setting in a mixed dtype frame. The chained assignment warnings / exceptions are aiming to inform the user of a possibly invalid assignment. There may be false positives; situations where a chained assignment is inadvertantly reported.